Rare earth elements like yttrium are difficult to extract from the ground, but they're crucial ingredients in flat screens and consumer electronics. Now a group of researchers have discovered massive deposits of these elements in mud on the deep sea floor. They believe we could start mining ocean mud to build more smart phones. 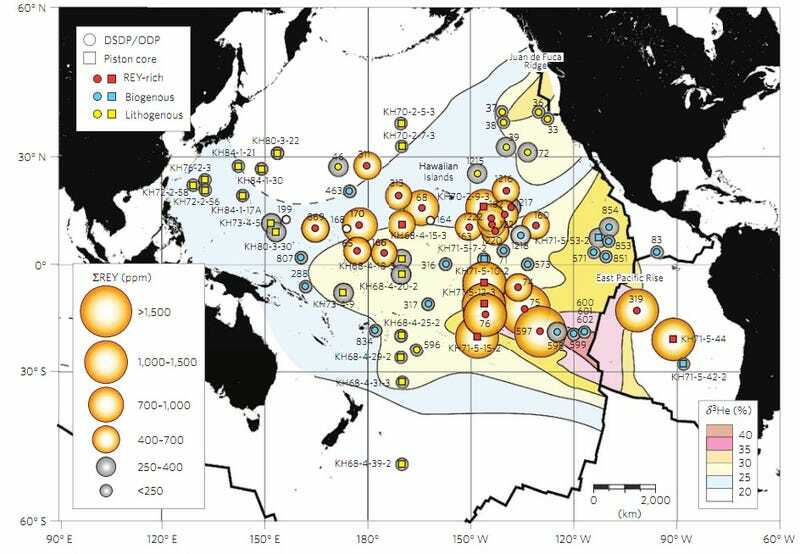 In this map of the Pacific Ocean (click to expand), you can see the sites where the scientists found mud saturated with yttrium and other valuable elements. Their discovery could usher in a rare earth element rush — on the bottom of the ocean. We estimate that an area of just one square kilometre, surrounding one of the sampling sites, could provide one-ﬁfth of the current annual world consumption of these elements. They believe the elements are so widely spread across the Pacific because they've been dispersed there over millions of years from two active hydrothermal vents, the East Pacific Rise and Juan de Fuca Ridge. Over time, particles from those vents have drifted on currents, and been metabolized by sea creatures, into the rare earth elements that are so difficult to mine on land without using techniques that many scientists have criticized for destroying wildlife and polluting rivers. What's even more unclear is how deep sea mud mining could be accomplished without destroying the delicate ecosystems at the bottom of the ocean, including corals and other creatures who are critical to the health of sea environments. Look carefully at the map above. You might be seeing a vision of tomorrow's mining industry.